One of the best things about summer is wonderful fresh vegetables out of the garden or from the Farmer’s Market. 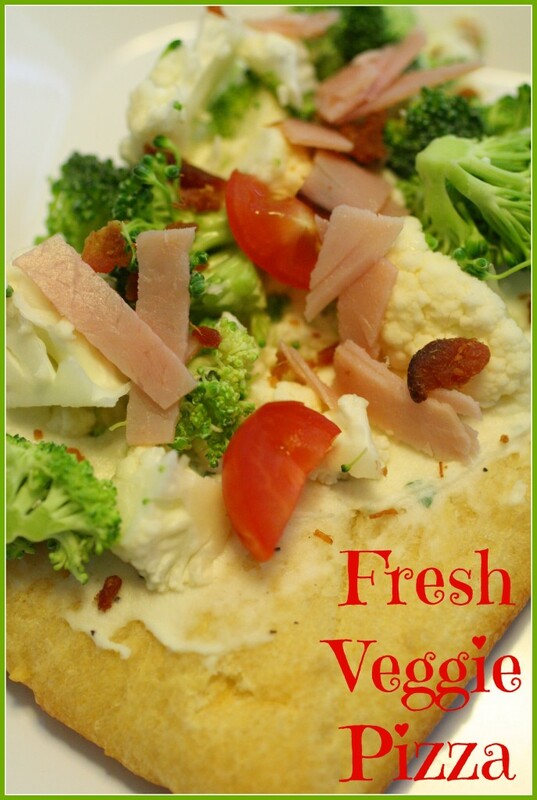 This fresh veggie pizza recipe is a great appetizer to serve at your next family get together or cook out! It is really simple and the combinations of vegetables are up to you! I heard about this recipe at the pool one day, and it sounded so good I had to try it out! 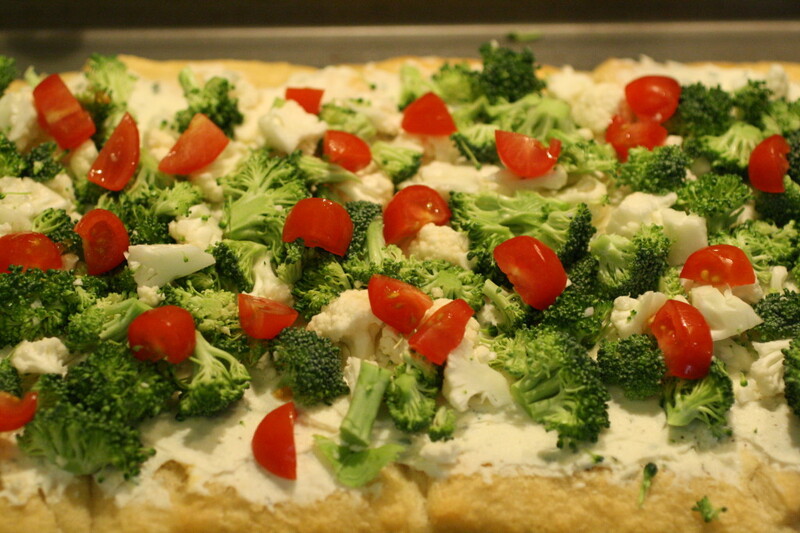 I used broccoli, cauliflower, grape tomatoes, and some ham and bacon bits. YUM! The first thing you want to do is to spread out your crescent rolls on a baking sheet and push them lightly to seal them together. 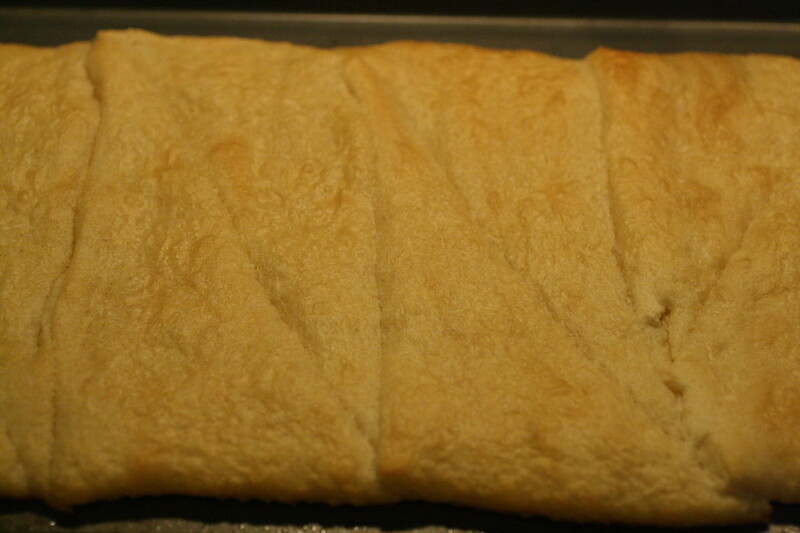 Follow the baking directions on the crescent roll can and bake. Remove from the oven and let cool while you prepare the vegetables. Let your cream cheese come up to room temperature and soften. Combine with the dry ranch dressing mix. I would start off with 1/2 packet and just make sure the taste is to your liking, if you want it stronger, add some more of the ranch mixture. I found using a whole packet made it a bit too tangy and salty. Chop up your veggies relatively small. I tried to make mine as small as possible. I cut the grape tomatoes into 8th’s. 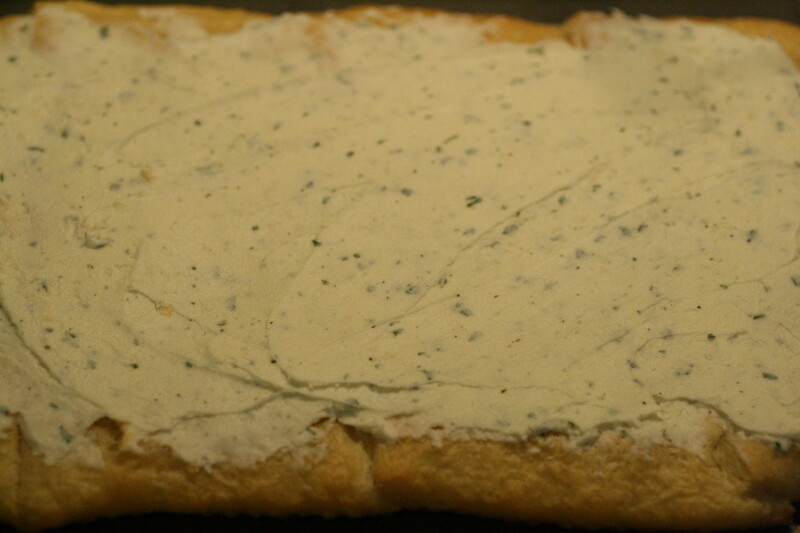 Spread the cream cheese and ranch mixture thinly over top of the crescent rolls. Layer your veggies and top with the tomatoes, ham, and bacon crumbles. Press lightly to get the veggies to adhere to the ranch and cream cheese mixture. I would suggest placing this in the refrigerator for about an hour prior to serving. 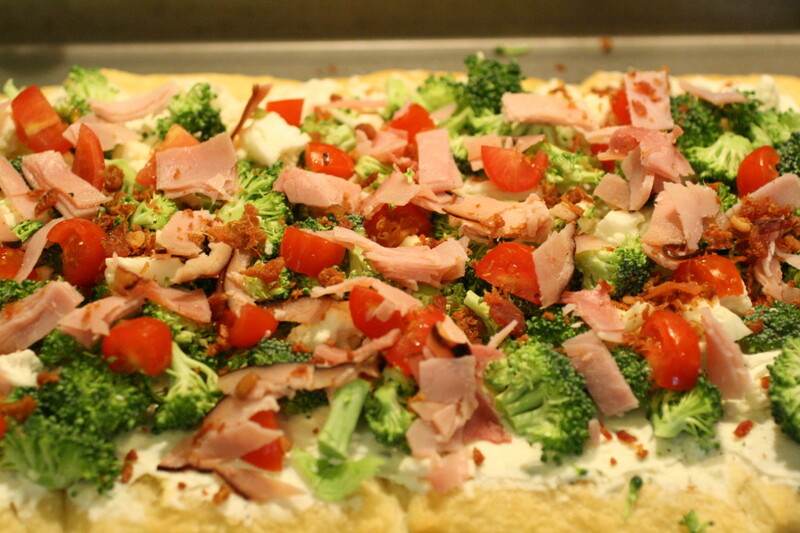 The possibilities of vegetables and even meat toppings is endless. You could use some small onion slices, green onions, green and red bell peppers, cucumbers, or any combination of vegetables available to you that are fresh or to your liking! 1. 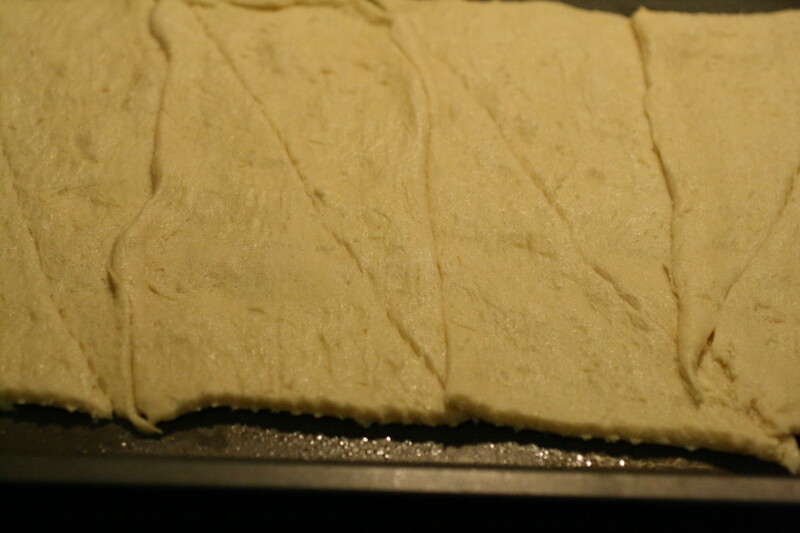 On a sprayed baking sheet, lay out the crescent rolls and push them together to form one large rectangle. Bake according to the directions. 2. Remove the crescent rolls once baked and let cool while you prepare the remaining ingredients. 3. Let your cream cheese come up to room temperature and soften. Mix with 1/2 packet of ranch dressing mix. If you want a stronger flavor, add in some more ranch dressing mix. 4. Spread the ranch dressing over top of the baked crescent rolls. 6. Refrigerate for 1 hour prior to serving. 7. Slice in to small squares and serve as a wonderful appetizer or finger food at your next function! This looks delicious and so healthy! I definitely need to try it! Thanks for sharing the recipe!